When you have a new baby there are so many things out there that you need to buy for them, and there are also a whole lot of things that you buy but rarely use! As the twins were my second babies I really whittled down the new baby purchases to what I actually NEEDED rather than getting sucked into buying just because I thought I should have it. We didn’t have the money to spare this time round so I was very thrifty when it came to buying for our twins. Aside from the obvious (car seat and somewhere to sleep) these are my best baby essentials for twins. 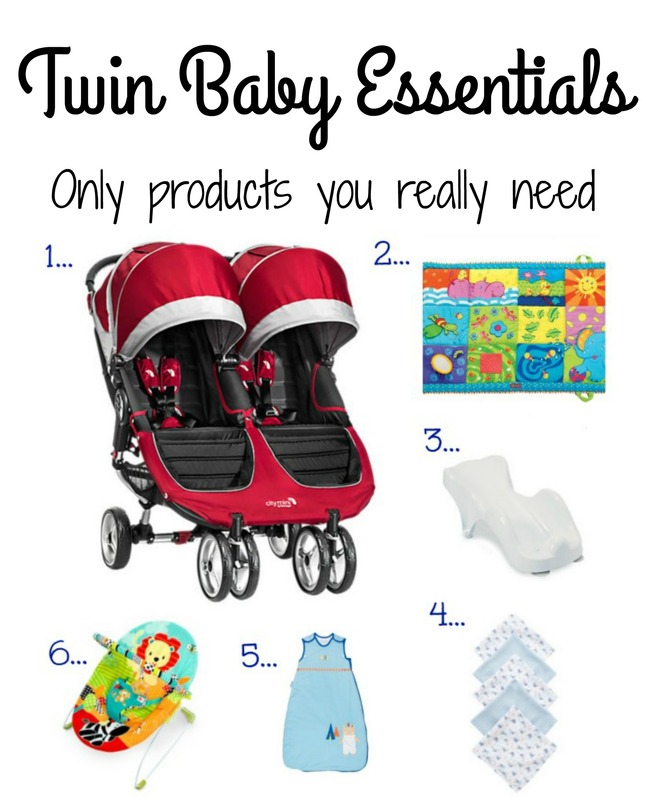 These are the baby products I actually could not have done without and if you really only want to get the essentials I don’t think you need much more than these for the first 4-6 months! 1. Double Buggy – Baby Jogger City Mini Twin Pushchair Any double pushchair will do really and it’s important to pick one that suits your lifestyle but this is the one we went for. I got a pre-loved bargain and it has been perfect, we could use it from birth and it will see them right through. It fits in our car and folds up relativity neatly so it doesn’t take over the house. 2. Large Play Mat – Tiny Love Supermat This was a great buy for our boys. We had a little one which lasted all of one week until we realised we really needed a jumbo one! It was constantly down for the first few months but it meant I always had somewhere to pop them, if they were sick on it it just went in the washing machine and as they got older it kept them entertained. 3. Bath Support – Bath Support I only bought these late on in pregnancy after seeing them at a twin antenatal class and they are absolutely amazing! Our twins could rest safely in them from about two weeks old so we could put them both in the big bath together and if needed it meant I could bath them on my own. So much easier and leaves your hands free to wash them properly. 4. Muslin Cloths – Muslin Squares Now I had a lot of these before our twins arrived but once they were born I bought more…and more…and more. You can never have enough! I used them to pop under their heads when they were sleeping so you didn’t have to change the whole bedding if they were sick. They were changing mats, blankets, swaddles, aswell as being used for a burping cloth. You will go through a lot with twins! 5. Sleeping Bag – Grobag These are just fantastic; if your twins are little sometimes it is difficult to find them small enough but ours went into them from about one week old. As long as they have poppers under the arms and you make sure they can’t wriggle down in them they are safe from any age. If they are sleeping together you know they aren’t going to get caught up in each other’s blankets and you don’t keep having to check they are wrapped up warm. 6. Bouncer – Bright Starts Bouncer We had two bouncers and used them right from the start every single day! I only got cheap ones and they were fantastic; the boys were in them until they could escape themselves. I used them for feeding; a twin in each chair and I’d sit in the middle with the bottles. They would nap in them occasionally and when I started weaning they were fantastic. I could always just pop them in a bouncer and I knew they were safe if I wanted to get a few jobs done. 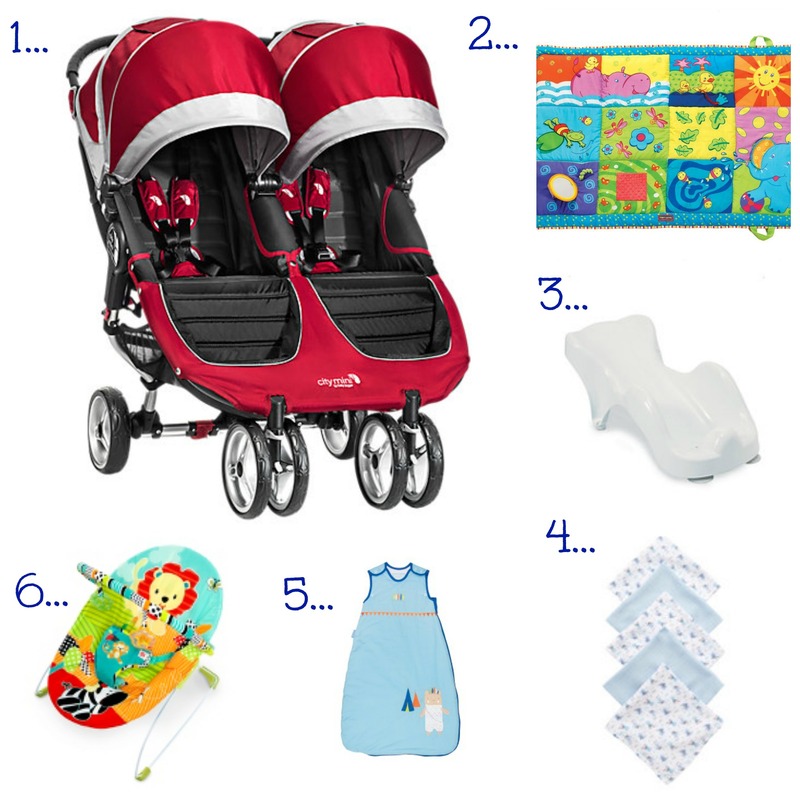 So there are my six best buys for twin babies, the newborn edition! Also, if you are breastfeeding then a twin breastfeeding pillow would be invaluable and if you are bottle feeding I know twin mums swear by the Tommee Tippee Perfect Prep machine. Both are on the pricey side so I didn’t use either but other twin mums have told me they are definitely worth considering! Had all of those items for my twins (the EXACT Boots bath supports – great aren’t they?). Started off with an inline pram/buggy/car seat system though. I wish those bath supports had existed when my twins were little! I learnt quite quickly that sitting in between their bouncers to bottle feed was by far the easiest way to feed them both.